Kick your next party off with a bang! Flutter FETTI’s celebration confetti is perfect for taking your celebrations to the next level and creating memories that’ll last a lifetime. Our party streamers and confetti are easy to use, look fantastic, and are simply a ton of fun. Check out our celebration confetti products and see just how much more exciting your next party can be! Are you hosting this year’s New Year’s Eve party? Want to throw a corporate event great party at the office that your employees or coworkers will love? No matter how big or small your event is, we’ve got just what you need. Our selection of party streamers and confetti is massive and includes options that are perfect for any celebration, including Mardi Gras, New Year’s, Fourth of July, Bar Mitzvahs, Gender Reveals, birthdays, and more. Name the occasion and we’ve got something that’s perfect for it! Flutter FETTI products are completely customizable and come in an amazingly wide range of custom colors from traditional white to turquoise, lavender, and striking scarlet red. Choose from party Streamers, Confetti, Corkscrews, fun and whimsical Die Cut shapes, and more! Some confetti companies choose to use cheap paper confetti in an effort to maximize profits. At Flutter FETTI, we’re focused entirely on making your celebrations the best they can be. We’ve spent countless hours in the lab testing our confetti and we’re happy to assure you that our celebration confetti will float in the air for up to 10 times longer than average confetti. This creates truly special, exciting moments. Also, our signature tissue Flutter FETTI is flame-resistant and non-toxic and our PVC film is also flame retardant. The most important aspect of throwing a fabulous party is making sure everyone who attends has FUN! Flutter FETTI party streamers and confetti products make affordable accent pieces, favors, and magnificent special effects Flutter FETTI has been making celebrations special since 1997. Since then, we’ve been creating new fantastic celebration confetti designs for events all over the country. 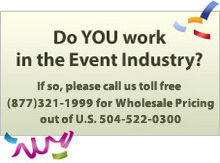 If you have any questions about our products, give our experts on party streamers and confetti a call at (877) 321-1999 or visit our Get A Quote page for more ways to get in touch. Make your next party truly unforgettable with celebration confetti from Flutter FETTI! Some Flutter FETTI products when saturated with any liquid and under pressure may bleed color, and Flutter FETTI® cannot guarantee or warranty that it will not do so. If any liquid will or may be present at an event, please consult with us so we can assist you in choosing water-safe FETTI® celebration confetti products.